Objective: In multiple sclerosis (MS), the aim of therapies is to prevent the accumulation of irreversible disability. This is difficult to assess given the short time course of clinical trials. MRI markers and relapses are often used as surrogate of disability in MS studies, but their validity remains controversial. We sought to validate, at the individual patient level, MRI lesions and relapses as surrogates for disability progression over the course of MS trials. Methods: Individual patient data from a large, placebo-controlled trial of interferon β-1a in relapsing-remitting MS (RRMS) were analyzed. The Prentice criteria were applied to evaluate surrogacy of 1-year MRI active lesions and relapses for disability worsening (Expanded Disability Status Scale [EDSS]) over the 2-year follow-up. Results: All Prentice criteria were satisfied. Treatment reduced by 31% the odds of having EDSS worsening over 2 years, reducing the mean number of MRI lesions by 61% and the mean number of relapses by 36% over 1 year. Both 1-year MRI lesion activity and relapses, when considered independently, accounted for more than 60% of the treatment effect on 2-year EDSS worsening. A combination of 1-year MRI lesion activity and relapses explained 100% of the treatment effect on EDSS worsening over 2 years. Conclusions: A combined measure of 1-year changes in MRI lesions and relapses after interferon therapy fully estimated the corresponding effect on 2-year EDSS worsening. This short-term combined measure appears to be a surrogate for disability progression over a longer term when evaluating the effect of interferon in RRMS. Prentice20 formulated 4 criteria for validating surrogates at the individual level. This approach has been applied to individual patient data from glatiramer acetate4 and interferon (IFN)5,6 trials to validate MRI markers as surrogates for relapses and disability. Using the alternative trial-level approach, a significant correlation was found between treatment effects on relapses and treatment effects on EDSS worsening.8 However, surrogacy of relapses for disability has never been assessed at the individual level. Against this background, we performed an individual patient analysis from a large pivotal trial, evaluating the effect of IFNβ-1a in relapsing-remitting multiple sclerosis (RRMS) to assess the relationship between EDSS worsening and its most frequently used surrogates: MRI active lesions and clinical relapses. The dataset comprised 560 patients with RRMS enrolled in the Prevention of Relapses and disability by Interferon beta-1a Subcutaneously in Multiple Sclerosis (PRISMS) study.21 In this double-blind, placebo-controlled trial, patients were randomized (1:1:1) to receive recombinant IFNβ-1a, 22, 44 μg, or placebo subcutaneously 3 times weekly for 2 years. Additional trial details including design, inclusion/exclusion criteria, and patients' clinical and MRI characteristics are reported extensively elsewhere.21,22 Briefly, all the patients had 5 biannual proton density/T2-weighted (PD/T2) MRI scans (baseline and follow-up scans at 6, 12, 18, and 24 months) that were reviewed in sequence. Active lesions were defined as the sum of “new T2 lesions” (those never seen before), “recurrent T2 lesions” (those reappearing at the site at which an earlier lesion had disappeared), and “enlarging T2 lesions” (those showing an identifiable increase in size from a previously stable-appearing lesion). All the analyses were run on the intention-to-treat (ITT) population. Sensitivity analyses were conducted on the subgroup of patients with complete 1-year and 2-year follow-up. The original study (clinical trial identifier number 6789) was approved by institutional review boards in the participating centers. All patients gave written informed consent. Progression of disability, defined as an EDSS increase ≥1 point over the follow-up period sustained for ≥3 months, was considered the true clinical outcome. Patients censored before 2 years were included as nonprogressed in the ITT analysis, and were excluded from the analyses on the subgroups with complete follow-up. Two potential short-term surrogates for disability progression were evaluated: a relapse endpoint, defined as the total number of relapses counted over the first year, and an MRI endpoint, defined as the number of MRI active lesions as defined in the trial protocol21,22 counted over the first year. MRI lesion activity was assessed centrally (University of British Columbia MS/MRI Research Group). Improvement of disability was also assessed and defined as an EDSS decrease ≤1 point over the follow-up period sustained for ≥3 months. Since the results of surrogacy validation did not change by keeping the 2 treatment arms separate, the analysis was simplified by pooling data into one treatment group. Comparisons of EDSS changes between treatment arms were assessed by a Mann-Whitney U test and differences in proportions of progressing and improving patients by a χ2 test. The regression models used are detailed in appendix e-1 on the Neurology® Web site at www.neurology.org. Briefly, the probability of disability progression at 2 years was modeled by unconditional logistic regression models, where treatment group, number of 1-year MRI active lesions, and number of 1-year relapses were introduced, in turn, as covariates. The strength of the association between each covariate and the probability of disease progression was expressed using the odds ratio (OR). An analysis based on binary events was preferred to a survival analysis. The analysis, in fact, was intended to detect a correlation between the number of MRI active lesions and relapses and the event of progression, rather than to study an exact temporal relationship between these events. The surrogacy of 1-year MRI activity and clinical relapses for disability at the end of the follow-up was tested using the 4 Prentice operational criteria.20 The first Prentice criterion requires a significant treatment effect on the surrogate. The treatment effect on MRI active lesions was evaluated using a negative binomial (NB)23 regression model and expressed as a relative risk (RR) representing a mean lesion number ratio. The treatment effect on relapse occurrence was assessed using a NB regression model, and expressed as a RR representing the ratio between the mean number of relapses in the IFN and placebo-treated groups. The second criterion requires a significant treatment effect on the clinical outcome. The treatment effect on the risk of disability progression was assessed, as specified above, using a logistic regression model, and expressed as an OR. The third criterion requires a significant correlation between the surrogate and the clinical outcome. Correlation between MRI active lesions and relapses with disability progression was evaluated using the same logistic regression model, with disability progression as the dependent variable and MRI active lesions and relapses as the covariates. Finally, the fourth Prentice criterion requires that the treatment effect on the clinical outcome disappear and become nonsignificant when adjusting for the surrogate. The absorption of the treatment effect on disability progression by MRI active lesions and relapses was assessed evaluating whether the treatment effect on disability progression decreases approaching zero when adjusting for these variables in the logistic model. Evaluation of the role of 1-year MRI active lesions as individual-level surrogate for the risk of disability progression over 2 years. Evaluation of the role of 1-year clinical relapses as individual-level surrogate for the risk of disability progression over 2 years. Evaluation of the combination of 1-year MRI active lesions and relapses as individual-level surrogate for the risk of disability progression over 2 years. To quantify the validity of surrogates, an additional measure was estimated: the proportion of treatment effect (PTE)24 on disability progression that could be attributed to benefits on MRI active lesions and relapses. For a “perfect” surrogate, the PTE would be 100%, indicating the absence of residual treatment effect after adjusting for the given marker. When there is no decrease in treatment effect when adjusting for a given marker, the PTE would be 0%, reflecting the absence of surrogacy for that marker. Confidence limits for the PTE were estimated by a bootstrap resampling technique. where B and C are the estimated coefficients. The score was categorized in tertiles and the proportion of patients with a disability progression per treatment arm was plotted according to the 3 groups defined by these tertiles. Longitudinal data relative to the MRI and clinical outcomes of patients included in the analysis are reported in table 1. The average EDSS change over the 2-year follow-up period was +0.30 EDSS point (SD = 1.1) for the placebo and +0.04 EDSS point (SD = 1.1) for the IFN group (p = 0.013). Over the 2 years of follow up, 31.5% of patients experienced a sustained EDSS progression (37% in the placebo arm, 29% in the IFN arm, p = 0.049), while 18% of patients had a sustained EDSS improvement (17% in the placebo and 20% in the treatment arm, p = 0.36). The results of the analysis of 1-year MRI active lesions and relapses as surrogate for the risk of disability progression on the ITT cohort over the whole follow-up are reported in table 2. Sensitivity analysis gave similar results (data not shown). Effect of treatment on 1-year MRI active lesions and relapses (first criterion). The treatment reduced the mean number of MRI active lesions counted over the first year of therapy by 61% in patients with RRMS (RR = 0.39, 95% confidence interval [CI] = 0.31–0.49, p < 0.0001). The treatment was also effective in reducing the mean number of relapses over the first year of follow-up: the relative reduction was 36% (RR = 0.64, 95% CI = 0.55–0.75, p < 0.0001). Effect of treatment on disability progression over 2 years follow-up (second criterion). The therapeutic benefit on disability progression, expressed as the OR, showed a benefit of IFN treatment over placebo (OR = 0.69, 95% CI = 0.47–0.99, p = 0.049). Association of 1-year MRI active lesions and relapses with disability progression (third criterion). The risk of progression was associated with the number of 1-year MRI active lesions (OR = 1.06, 95% CI = 1.03–1.08, p < 0.0001). The number of relapses over 1 year also strongly affected the risk of disability progression over the entire follow-up period (OR = 1.58, 95% CI = 1.35–1.86, p < 0.0001). When both 1-year MRI active lesions and relapses were included into a multivariate logistic model, they were independently associated with the risk of disability progression (MRI active lesions: OR = 1.04, 95% CI = 1.01–1.06, p = 0.006; relapses: OR = 1.49, 95% CI = 1.26–1.76, p < 0.001). One-year MRI active lesions and relapses as surrogate for disability progression (fourth criterion). MRI/relapse score = 0.036 × (number of 1-year MRI active lesions) + 0.40 × (number of 1-year relapses). As shown in the figure, there were no differences between the treatment arms within the groups defined according to the tertiles of the score. This is a visualization of the absence of residual benefits on EDSS worsening from treatment in any of the groups defined by the combined score, indicating a good level of surrogacy of the combined 1-year MRI lesions/relapses score for 2-year disability. 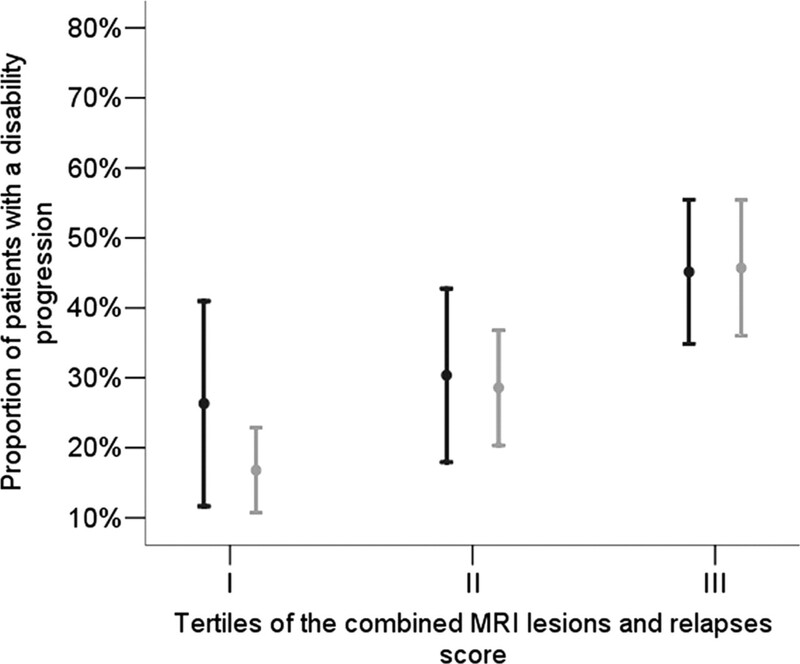 Proportion of patients with a disability progression over 2 years according to risk groups defined as the tertiles of the distribution of the combined score of MRI active lesions and relapses during the first year of the study (I tertile: 0–0.25, II tertile: 0.26–0.80, III tertile: 0–81+; see the text and appendix e-1 for details). Progression was defined as an increase of at least 1 Expanded Disability Status Scale point confirmed after 3 months. Black points represent placebo patients and gray points represent interferon-treated patients. The bars represent 95% confidence intervals. The validation of surrogate markers is a complex process based on cumulative evidence that needs to be provided at both the trial and individual levels.25 Trial-level surrogacy requires an association, at the level of the trial, between the effects of a treatment on the surrogate and the clinical endpoint. In the MS field, the trial-level surrogacy of both MRI lesions and relapses vs the true endpoint “EDSS worsening” has been recently addressed in a large meta-analysis of randomized studies.8 Individual-level surrogacy requires a causal relationship between surrogates and true endpoints at the patient level. In the present study, individual patient data from a large trial on patients with RRMS were used to assess the relationship between “EDSS worsening” (true endpoint) and both MRI active lesions and relapses (surrogate endpoints). According to the Prentice criteria, both 1-year MRI active lesions and clinical relapses independently accounted for more than 60% of the treatment effect on 2-year EDSS worsening. This provides evidence that clinical relapses and MRI active lesions can both be surrogates for disability progression in patients with RRMS treated with IFNβ-1a. With the surrogacy of MRI active lesions and relapses individually having been established, the question as to whether the combination of these 2 measures could be a better individual-level surrogate for the disability worsening was examined, an issue that has never been assessed before. No residual effect of IFN on EDSS worsening at 2 years was observed after adjusting for a combination of 1-year MRI active lesions and relapses (fourth Prentice criterion). Therefore, in patients with RRMS, the effect of IFN on 2-year disability progression (the typical follow-up duration of clinical trials) appears entirely mediated by the treatment-induced reduction in the number of MRI active lesions and relapses during the first year of treatment. As a consequence, the proportion of reduction in disability progression that can be attributed to a reduction of MRI lesions and relapses together can be considered as 100%, suggesting that IFN treatment does not affect the risk of disability progression over 2 years with alternative mechanisms of action that do not involve an effect on relapses and MRI activity. The observations conducted here at the individual patient level add to the previously mentioned results of a meta-analysis8 showing good trial-level surrogacy of both relapses and MRI lesions for disability progression. Taken together, these consistent results provide strong scientific evidence for the current trial practice of using clinical relapses as primary endpoints in phase III RRMS trials of IFNs or drugs with a similar mechanism of action, and even better when supported by (or combined with) MRI markers. These results also suggest that the additional efforts for increasing patient numbers or trial duration needed to power RRMS pivotal trials on disability endpoints are not justified when evaluating IFN or drugs with similar mechanisms of action, since the full effect on EDSS worsening over 2 years is mediated by the effect measurable on active MRI lesions and relapses after the first year of therapy. This may have major implications for the MS field, since IFNβ is about to come off patent and the present analysis may help to convince the regulatory agencies to accept surrogate outcomes for assessing IFNβ biosimilars. The findings of the current study are in apparent contrast with results from other recent work, which found low correlations between short-term MRI markers and relapses both with the short-term18 and long-term (more than 20 years) progression of unremitting disability.17 The high heterogeneity of data coming from observational studies make their results difficult to compare with those of the present analysis conducted on data from a controlled clinical trial. Furthermore, these previous studies17,18 are focused on the role of MRI markers and relapses as prognostic factors for the accumulation of disability rather than on their validity as surrogate outcomes. In contrast, our study, using both the placebo and the treatment arms from a randomized trial, relates the effect of treatment on short-term markers of disease activity with the effect of treatment on disability progression over 2 years, specifically focusing on the assessment of the validity of these widely used endpoints as surrogates in the context of MS clinical trials. The limitations of surrogacy validation studies have been extensively discussed elsewhere,6 but several points are worthy of mention here. First, it must be pointed out once more that the validation of surrogates is treatment specific. Thus, the findings reported here cannot be extended to all MS therapies, even though they may prove useful in interpreting the outcomes of future MS trials. Second, these results do not address the critical issue of whether a short-term change in disability progression is necessarily the clinical outcome of interest in MS trials. In this regard, there has been some evidence supporting the hypothesis that EDSS worsening in RRMS as measured in clinical trials over 2- to 3-year periods might be a transient consequence of a recent relapse at the time of disability assessment26 and does not necessarily imply a true “disability progression.” If this is the case, these results may suggest the need of defining better clinical outcomes to assess disability accumulation in future MS studies. However, the longstanding controversy27 on the optimal approach to measuring disease severity, disability, and progression in MS or on the best outcome measure for evaluating the impact of disease-modifying therapy is beyond the scope of this article. As already stressed, the results of the present study simply indicate that the effect of IFN on short-term disability progression, which is the one usually measured in clinical trials, is fully mediated by the effect on short-term MRI lesions and relapses. Another limitation of the present analysis is the wide confidence limits of the PTE explained by MRI lesions and relapses on disability progression. The lack of precision of this measure is intrinsic24 but is also due to the low power of such analyses when conducted on single study not designed to detect such relationships. To this aim, an individual patient meta-analysis, collecting data from all clinical trials in RRMS evaluating similar drugs, would be better suited. The findings of the present analysis warrant confirmation by a meta-analysis of this kind. Furthermore, it must be noted that since the coefficients for the combined MRI/relapse score and the corresponding PTE have been estimated based on the same set of data, the PTE results maximized for this particular set of data. This is an additional point calling for a validation of these results on independent datasets. Finally, with the rapid evolution of MRI methods, it is likely that an analysis of more recent MRI datasets would generate less variability and tighter confidence limits. This study provides evidence that MRI active lesions and clinical relapses, when used in combination, are a valid surrogate for disability progression over the typical duration of clinical trials in patients with RRMS treated with IFN or another drug with a similar mechanism of action. The relationship of short-term markers of disease activity with long-term accumulation of irreversible disability remains a crucial issue that must be addressed with longer follow-up studies. Dr. Sormani had the idea of the study, was substantially involved in the conception and design of the study protocol, planned and conducted the statistical analysis and gave interpretation of the results, prepared and reviewed the manuscript. Dr. Li was substantially involved in the design and execution of the PRISMS (Prevention of Relapses and disability by Interferon beta-1a Subcutaneously in Multiple Sclerosis) study that provided the data for the present study. He was substantially involved in the interpretation of data; and the preparation, review, and critique of the manuscript. Dr. Bruzzi was substantially involved in the conception and design of the study protocol; the statistical analysis the interpretation of results; and the preparation, review, and critique of the manuscript. Dr. Stubinski was substantially involved in the design of the study protocol; the interpretation of data; and the preparation, review, and critique of the manuscript. P. Cornelisse was substantially involved in the design of the study protocol, validated the statistical analysis, contributed to interpretation of data, and participated in the preparation, review, and critique of the manuscript. Dr. Rocak was substantially involved in the design of the study protocol; the interpretation of data; and the preparation, review, and critique of the manuscript. Dr. De Stefano was substantially involved in the idea of the study, the conception and design of the study protocol; the interpretation of data; and the preparation, review, and critique of the manuscript. Dr. Sormani serves on a scientific advisory board for Biogen Idec; has received funding for travel and speaker honoraria from Merck Serono; serves as a consultant for Merck Serono, Actelion Pharmaceuticals Ltd, Biogen Idec, and Synthon; and serves on speakers' bureaus for Teva Pharmaceutical Industries Ltd., Merck Serono, and Biogen Idec. Dr. Li served on scientific advisory boards for Roche and Nuron Biotech; serves on the speakers' bureaus for the Consortium of MS Centers, Teva Pharmaceutical Industries Ltd., and Merck Serono; serves as a consultant for Genzyme Corporation; performs MRI (50% clinical effort); is the Director of the UBC MS/MRI Research Group, which has been contracted to perform central analysis of MRI scans for therapeutic trials with Angiotech, Bayer Schering Pharma, Berlex-Schering, BioMS Medical, Centocor (Janssen), Daiichi Sankyo, Genzyme Corporation, Roche, Merck Serono, Schering-Plough Corp., Teva Pharmaceutical Industries Ltd., Novartis, sanofi-aventis, and Transition Therapeutics Inc.; and receives research support from the MS Society of Canada and the Canadian Institute of Health Research. Dr. Bruzzi reports no disclosures. Dr. Stubinski is an employee of Merck Serono S.A.–Geneva, Switzerland, an affiliate of Merck KGaA, Darmstadt, Germany. Dr. Cornelisse is an employee of Merck Serono S.A.–Geneva, Switzerland, an affiliate of Merck KGaA, Darmstadt, Germany. Dr. Rocak is an employee of Merck Serono S.A.–Geneva, Switzerland, an affiliate of Merck KGaA, Darmstadt, Germany. Dr. De Stefano serves on scientific advisory boards for Merck Serono; has received funding for travel from Merck Serono and Teva Pharmaceutical Industries Ltd.; and has received speaker honoraria from Teva Pharmaceutical Industries Ltd., BioMS Medical, Biogen-Dompé AG, Schering-Plough Corp., sanofi-aventis, and Merck Serono. The authors acknowledge the efforts of the UBC MS/MRI Research Group (Donald Paty [deceased], Andrew Riddehough, Anthony Traboulsee, Guojun Zhao, Yan Cheng, Xiuyu Wang, and the analysis technicians) who performed the MRI lesion activity assessments. Study funding: This work was supported by Merck Serono S.A., Geneva, Switzerland (an affiliate of Merck KGaA, Darmstadt, Germany), which allowed for the use of the individual-patient database, collaborated in planning the study, and validated the statistical analyses by double programming.
. Magnetic resonance imaging as a surrogate outcome measure of disability in multiple sclerosis: have we been overly harsh in our assessment? Ann Neurol 2006;59:597–605.
. Magnetic resonance imaging as a surrogate outcome for multiple sclerosis relapses. Mult Scler 2008;14:770–778.
. MRI metrics as surrogate markers for clinical relapse rate in relapsing-remitting MS patients. Neurology 2002;58:417–421.
. MRI metrics as surrogate endpoints for EDSS progression in SPMS patients treated with IFN beta-1b. Neurology 2003;60:1462–1466.
. Magnetic resonance active lesions as individual-level surrogate for relapses in multiple sclerosis. Mult Scler 2011;17:541–549.
. Magnetic resonance imaging as a potential surrogate for relapses in multiple sclerosis: a meta-analytic approach. Ann Neurol 2009;65:268–275.
. Surrogate endpoints for EDSS worsening in multiple sclerosis: a meta-analytic approach. Neurology 2010;75:302–309.
. A controlled trial of natalizumab for relapsing multiple sclerosis. N Engl J Med 2003;348:15–23.
. Oral fingolimod (FTY720) for relapsing multiple sclerosis. N Engl J Med 2006;355:1124–1140.
. Effect of laquinimod on MRI-monitored disease activity in patients with relapsing-remitting multiple sclerosis: a multicentre, randomised, double-blind, placebo-controlled phase IIb study. Lancet 2008;371:2085–2092.
. A phase II study of the safety and efficacy of teriflunomide in multiple sclerosis with relapses. Neurology 2006;66:894–900.
. Daclizumab in active relapsing multiple sclerosis (CHOICE study): a phase 2, randomised, double-blind, placebo-controlled, add-on trial with interferon beta. Lancet Neurol 2010;9:381–390.
. Efficacy and safety of oral fumarate in patients with relapsing-remitting multiple sclerosis: a multicentre, randomised, double-blind, placebo-controlled phase IIb study. Lancet Neurol 2009;372:1463–1472.
. A placebo-controlled trial of oral cladribine for relapsing multiple sclerosis. N Engl J Med 2010;362:416–426.
. The natural history of multiple sclerosis, a geographically based study 10: relapses and long-term disability. Brain 2010;133:1914–1929.
. MAGNIMS Steering Committee MRI as an outcome in multiple sclerosis clinical trials. Neurology 2009;73:1932.
. Surrogate endpoints in clinical trials: definition and operational criteria. Stat Med 1989;8:431–440. PRISMS (Prevention of Relapses and disability by Interferon beta-1a Subcutaneously in Multiple Sclerosis) Study Group. Randomised double-blind placebo-controlled study of interferon beta-1a in relapsing/remitting multiple sclerosis. Lancet 1998;352:1498–1504.
. Magnetic resonance imaging results of the PRISMS trial: a randomized, double-blind, placebo-controlled study of interferon-beta1a in relapsing-remitting multiple sclerosis: Prevention of Relapses and Disability by Interferon-beta1a Subcutaneously in Multiple Sclerosis. Ann Neurol 1999;46:197–206.
. Modelling MRI enhancing lesion counts in multiple sclerosis using a negative binomial model: implications for clinical trials. J Neurol Sci 1999;163:74–80.
. Estimating the proportion of treatment effect explained by a surrogate marker. Stat Med 1997;16:1515–1527. eds. The Evaluation of Surrogate Endpoints. New York: Spinger Science+Business Media, Inc.; 2005.
. Surrogate endpoints for EDSS worsening in multiple sclerosis: a meta-analytic approach: measuring disability in relapsing-remitting MS. Neurology 2011;76:1025.